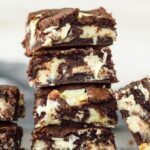 Fudge Stuffed Chocolate Cookie Bars – Deliciously soft and chewy chocolate cookie bars that are stuffed with white chocolate chips, and filled with a white chocolate fudge centre! If you’ve made and enjoyed my Fudge Stuffed Chocolate Chip Cookie Bars, you’ll love today’s recipe! 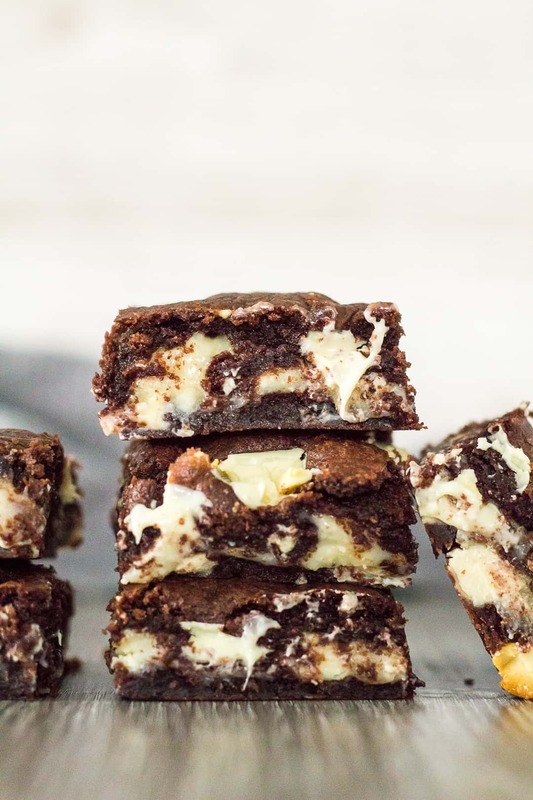 Soft and chewy chocolate cookie bars loaded with white chocolate chips/chunks, and filled with a white chocolate fudge centre. What’s not to love?? If you’re a huge chocolate lover like me, you’ll fall in love with the two types of chocolate together in these bars. You won’t be able to stop at just one bar – trust me! 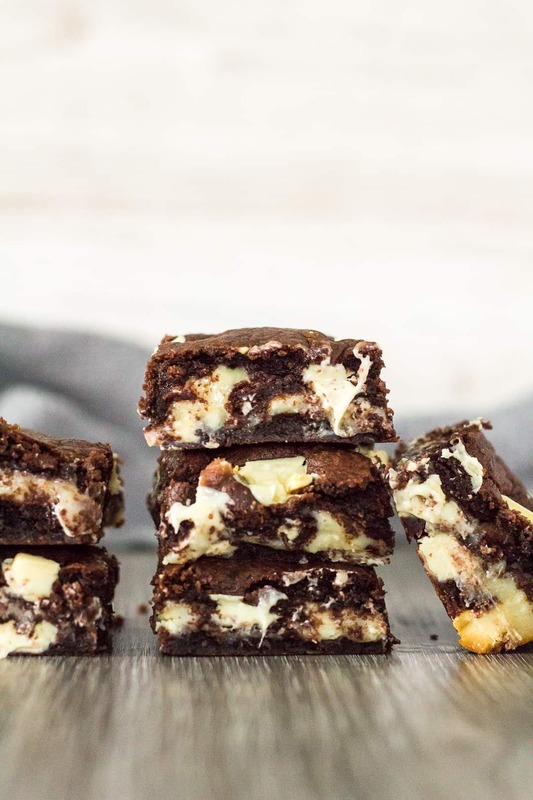 To make these chocolate cookie bars, simply whisk together the flour, cocoa powder, baking powder, baking soda, and salt. Set aside. In a separate bowl, whisk together the butter and sugars until combined. Add the egg, and vanilla, and mix until combined. Add the dry ingredients and mix until just combined. Fold in the white chocolate chips. Press half of the cookie dough into an 8×8-inch square baking pan lined with foil or parchment paper. 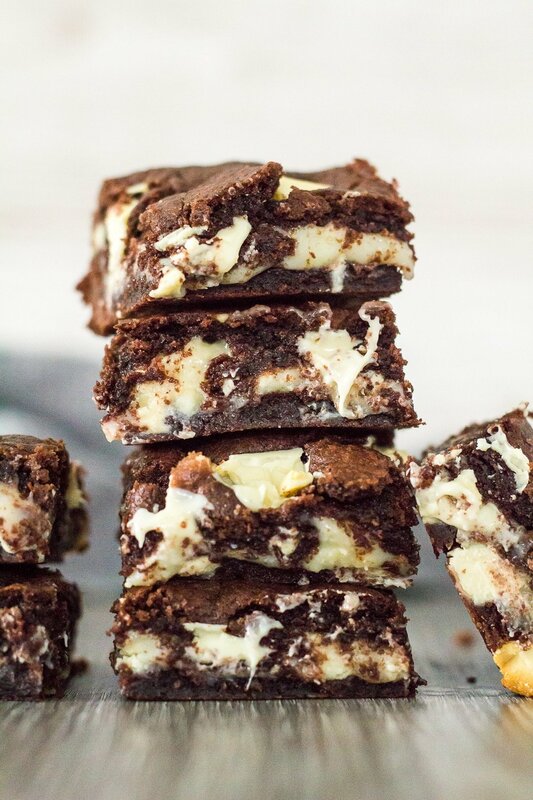 For the fudge, place the white chocolate into a microwave-safe bowl, and heat in 20 second intervals until melted and smooth. Add the condensed milk, and mix until combined. Spread the mixture into the prepared pan, and smooth out the top. Place the remaining cookie dough on top and sprinkle with extra chocolate chips. Bake for 25 – 30 minutes, then allow to cool completely in the pan on a wire rack before cutting into bars. How long will these cookie bars last? These bars will stay fresh, stored in an airtight container, at room temperature or in the fridge for up to 1 week. Can I freeze these cookie bars? Yes. These bars freeze well for up to 3 months. Thaw overnight in the fridge before serving. Try these delicious bars next! 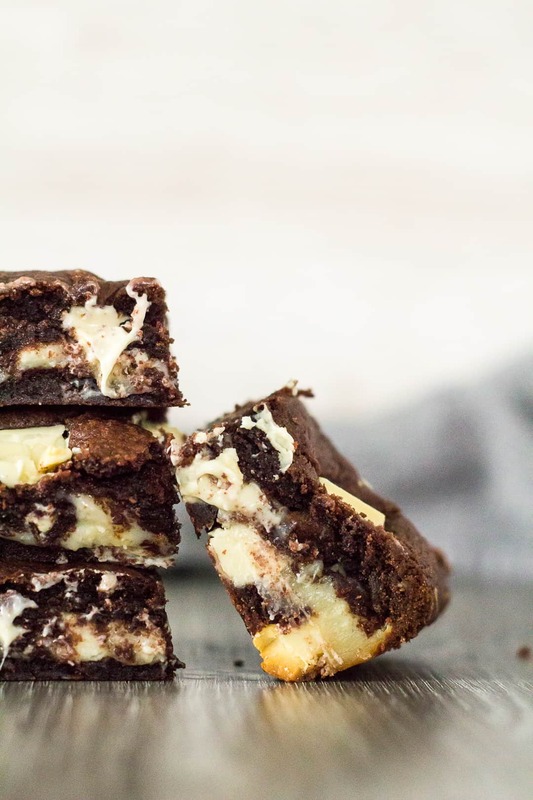 Deliciously soft and chewy chocolate cookie bars that are stuffed with white chocolate chips, and filled with a white chocolate fudge centre! Preheat the oven to 180C/350F/Gas 4. Line an 8x8-inch square baking pan with foil or parchment paper. Set aside. Whisk together the flour, cocoa powder, baking powder, baking soda, and salt. Set aside. Whisk together the butter and sugars until combined. Add the egg, and vanilla, and mix until combined. Add the dry ingredients, and mix until just combined. Fold in the chocolate chips. Press half of the dough into the prepared pan. Place the white chocolate into a microwave-safe bowl, and heat in 20 second intervals until melted and smooth. Add the condensed milk, and mix until combined. The mixture will be quite thick. Bake for 25 - 30 minutes. Allow to cool completely in the pan on a wire rack before cutting into bars. Bars stay fresh, stored in an airtight container, at room temperature or in the fridge for up to 1 week. They also freeze well for up to 3 months. Thaw overnight in the fridge before serving. Okay, this is seriously such a perfect holiday treat! That fudge center looks fantastic!